As a homeowner, it’s highly recommended that you know the specifics of your residential wiring and circuits. While you don’t need a deep understanding of how circuits function, you should be familiar with the basic layout of your home. Chances are, you don’t know your current wiring and circuits. To help get a better idea of how they function to keep your home running, we can help map out the layout of your house’s current electrical setup. Electrical systems aren’t just a web of connected wires; they are actually a complex and intricate system which is specifically designed to control power all over your home. Updated wiring can help support modern amenities such as home offices, kitchen appliances, and home theaters. Knowing how your home’s electrical system works allows you to understand how circuits work and will help you locate a malfunction. Our business focuses on keeping your home up to date and verifying that the current electrical system in your home is working properly. It’s not uncommon for houses to have electrical issues, especially if they’re older models. When residential electrical systems haven’t been checked in 20 years, you’ll notice that there will be more issues with controlling the power in the home. This can range from simple glitches all the way to full-on power surges. We aim to keep your home safe, and we don’t want you to be at risk of an electrical fire or see your personal belongings damaged. Make an appointment with us, and we will help work with you to map out your current system. What Happens When I Turn On a Light Switch? While many homeowners understand the primary function of how a light switch works, they don’t understand the exact electrical system that makes it function. There are three different types of wall switches, each that feature different functions; on/off switches, three-way switches, and four-way switches. Depending on what type is installed in your home, the wiring surrounding these switches will control the lights in a different way. The on and off type functions, as you might expect, by turning a light on and off from one switch. These models of switches are often called “single pole” or “single throw” switches. It means that one hot wire will be connected to the switch, functioning only to turn the electric current off and on from the one location. An on and off switch is installed with a spring loaded gate. When you turn the lights on, the gate will close the circuit and allow electricity to flow from the switch to the light. However, when you switch the light off, the switch opens the circuit and will interrupt the electrical current to the light. A three-way switch is termed a “single pole double throw.” There are two wires connected to it, but only one of these is a hot wire. The “double” part comes in when you turn the switch on. Instead of just opening and closing the electrical current to the circuit, it changes the hot wire between two wires. These two wires are in a V shape and allow the light to be turned on and off from two separate locations. A four-way switch is called a “double pole double throw switch.” It has two hot wires connected to it and two wires that connect to a panel. A four-way switch works similarly to a three-way switch, but instead of powering just two different switches, it instead focuses on three connections or more. While these switches aren’t common, they can be useful in a large room. You’ll be able to control the lights in three different locations and use each switch to turn the light on or off. When one switch is turned on, all you’ll need to do is switch one of the switches again, and the interrupted current will turn the light off. How Do Light Sockets Work? Our experts understand how the wiring and circuits work in multiple types of switches. They’ll also be able to explain to you how light sockets work. If you’ve ever been in science class, you may have completed an experiment where you connect a battery to a light bulb. Light sockets work similarly to this. A hot wire is connected to a tab-shaped conductor inside of the socket. When this happens, the contact then touches the very end of the light bulb. As the unit does this, the return wire will also touch the base of the socket, thus creating a circuit. As long as these two connections are made, the light bulb will stay on. Once the electricity is disconnected, the energy will flow through one end of the socket and stop at the other end. If a socket is not connected tightly to an electricity source, the light will not turn on. As houses begin to age, there will be issues with the light bulbs continuing to remain in tight contact with a poor source. This can cause the lights to malfunction, flicker, and stop working altogether. As time progresses, you’ll also find corrosion in the kitchen and bathroom sockets, causing the light bulb to dim. Our professionals want to ensure that your home has working circuits that are up to date and functional. Knowing how the circuits work in your home can help you locate a problem in case of an emergency. 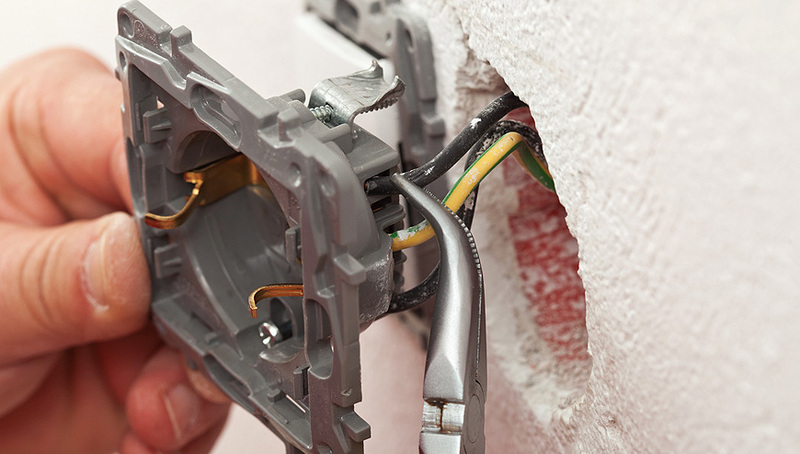 Our professionals can help you locate these wires and fix any problem that comes our way. If there are issues with the light fixtures, we can help repair the circuits and ensure that all of the sockets are intact. Don’t hesitate to contact us for even the smallest of electrical jobs, as we are willing to help. This includes light fixture installations. Contact us at 678-298-9363 for a consultation and assessment.